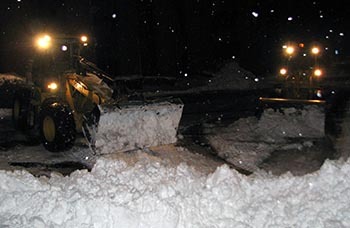 Pihl Excavating provides exceptional, high-quality snow removal to ensure our customer's properties are safe from any snow accumulation. Our crew is well trained and is equipped with a number of pieces of equipment to battle any storm. We use the right equipment and tools for every job. Whether it is a large or small front-end loader, grader, a Bobcat Skid Steer loader or hand shovels, we get the job done fast and efficiently.